The TMNT are flying home from Jerusalem in a cargo plane when it’s attacked by a strange being with an eyeball for a head. The pilot is knocked unconscious by the creature’s assault and the ship begins to plummet towards the ocean. After Future Don and Raph had finished helping the Mutanimals build their island base, the aliens Skul and Bean arrived and attacked. The Mutanimals defeated their old foes, but as soon as the battle was won, four more villains arrived (one of them being the werid eyeball dude who attacked the cargo plane) with guns. The criminals then shot the mutants to death. After the massacre, the villains got into Skul and Bean’s spaceship and took off. Later, after the Mutanimals have been buried on the beach, Future Don, Future Raph, Slash and Candy board the Mutanimals’ ship and head for New York City. On the way, Future Raph decides that he wants to fly by the cargo plane that their younger selves are on. Future Don dials the radio into air traffic control and discovers that the cargo plane has crashed into the ocean! 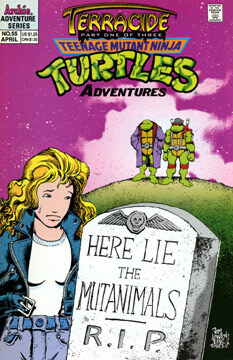 Future Don flies to the site of the wreck and sets the airship down to rescue the TMNT and Ninjara. Unfortunately the Coast Guard has also arrived on the scene and they’ve taken Michaelangelo! The guys decide to land on a nearby sandbar and make plans on how to rescue Mikey, but as soon as they’ve gotten off their ship, none other than the demon Null arrives – and he’s brought the four gun-toting villains with him to shoot the rest of our heroes!